Home Costs > How Much Do Floor to Ceiling Window Replacement Cost? How Much Do Floor to Ceiling Window Replacement Cost? Floor to ceiling windows create a lot of living space and allow the maximum level of natural light to enter a home. The costs involved when having floor to ceiling windows installed or replaced vary from one provider to another and will typically depend on several factors such as the size, geographical location and if the window is simply be replaced or has to be installed in a new area. How much does a floor to ceiling window cost? The cost of a floor to ceiling window will depend on the materials it’s made from, the size of the window, the shape, thickness, glass, the contractor you choose and the company that manufactures the windows and other factors. Based on these factors and the ones listed below, the prices can vary anywhere from $10 to $40+ per square foot. With so many varying factors, it’s best to consider getting multiple quotes for free from online companies such as HomeAdvisor.com. Simply describe your window situation and contractors will contact you with quotes for free via email. According to ReplacementWindowsforDummies.com, the cost of replacing glass windows depends on the size, shape, coating, thickness, glass type, window style, and manufacturer. Standard glass can cost up to $10 per square foot but adding extras can increase the price to $14 per square foot or more. On this Gardenweb.com forum thread, a forum member said they were quoted $4,000 for a window that was eight feet tall and 12 feet wide, with a five-foot opening. The fixed panels, when everything was said and done, was close to $40 per square foot. Another member said you should be looking at $30 to $45 per square foot for a Pella window. Zolton Cohen from MLive.com said you should be prepared to spend $9 to $10 per square foot for a new insulated glass window with a low-E coating, but if you needed a new frame, the price could increase. Glass windows are usually measured by the square foot. The larger the window frame or the area where the windows will be installed, the higher the overall price of the window replacement or repair project. Glass windows are available in different types: standard, heat efficient, low-emissivity, strong (laminated, tempered, wired, and fire-resistant), mirror or self-cleaning, and reduced visibility. Standard glass is the most affordable option. 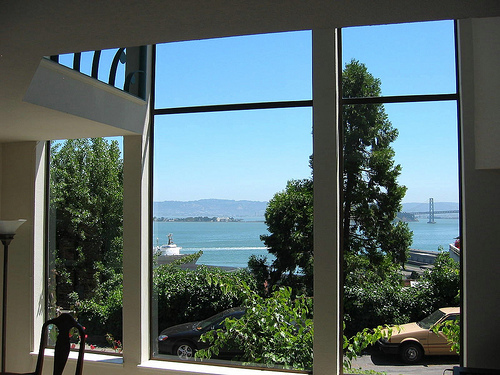 Shatterproof glass costs more than coated or the single-pane type. Fire-resistant glass is among the most expensive types. Many glass windows today are built with features that make them durable, environment-friendly and energy-efficient. Glass window materials like fiberglass are often designed with durability, sustainability, better resistance to air and water, improved structural strength, as well as resistance to forced entry. These features usually increase the total price of windows. Many window replacement projects need only new panes rather than new window frames. There are different types of windows used as replacements or for repair jobs, but in general, the cost of a single window replacement with an existing window frame can cost between $300 to $700, depending on factors like style, size and the quality of the materials. The cheapest options can be about $150 and $1,000 for high-end window types. On average, window replacements for a regular home can cost approximately $2,000 to $10,000. For larger, two-story houses, glass window replacements can cost around $5,000 to $20,000. If new frames need to be installed, the cost can add 50 to 100 percent of the estimated figures. Heat-efficient glass, such as a low-E or tinted windows, will cost more than ordinary glass. Low emissivity coating, or low-E, is a metallic oxide covering added to a window to protect it from the heat of the sun during the summer months and to block cool air during the winter. Window panes with low-E features often increase the base price of replacement windows by 10 to 15 percent. Tinted windows come with a heat reflective film that works to ward off the sun’s rays, which subsequently minimizes cooling bills. Tinted floor to ceiling windows can cost $5 to $7 per square foot. Since tinting reduces visibility in the home, it is often ideal in rooms where privacy matters. Also known as double glazing, double-paned windows feature two panes of glass with about a quarter-inch space in between that contains non-combustible gas to improve insulation. Double-pane windows often cost more due to their ability to reduce heat loss by 50% and deflect outside noise. An average window with double-pane glass can cost approximately $650 to $800. Shades or drapes that suit the overall design will be an additional cost to consider. Since these windows are much larger than the traditional window, be prepared to spend more than an average sized window. If replacing a floor to ceiling window, the older frames may need to be replaced. While optional, adding a clear plastic film can help reduce the heat transmission and can add another $1 per square foot if installed by a professional contractor. Installing energy-efficient windows may entitle you to a federal and/or local tax refund.